Could anything be more rewarding to a teacher than hearing that your music lessons propelled a student to excel in all her academics, or that you played a part in the choice of a musical career, or that your coaching inspired a second generation of young musicians? “Beloved violinist and teacher Hilary Schacht reaps scores of such rewards for her work in the popular Strings in Our Schools (SIOS) program,” says Deborah Leah Ungar, Director of Education and Outreach for the Festival. Strings in Our Schools, the third branch of the Santa Fe Chamber Music Festival’s educational offerings, provides weekly one-hour violin lessons to about 60 at-risk students who do not have such musical opportunities at their schools. 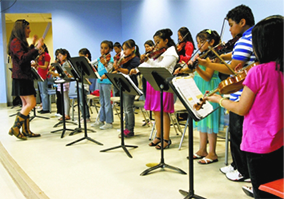 Participating students at Ramirez Thomas, Tesuque, Pecos, and Sweeney elementary schools are given the use of violins for the school year, while also enjoying the rewards and excitement of performing in one or more concerts annually. Available at no cost to the students, SIOS introduces kids at beginner and intermediate levels to hands-on music-making—an experience they might not otherwise have. The program lets them share in the joy of music-making, builds their confidence and self-esteem, gives them a sense of responsibility and self-discipline, and aids their overall academic achievements. And best of all, it encourages them to stay in school. Getting into the Strings in Our Schools program is competitive, and once in, students are evaluated on attendance, behavior, responsibility for and care of the instrument, practice, homework, technique, reading music theory, ear training, parental support, and performance! These kids are certainly held to high standards! But when it all comes together in the concert at the end of the school year, the pay-off is plain to see and hear. Hilary not only teaches all the classes but also coordinates all the details involved in scheduling, recruiting, and arranging concerts with principals and classroom teachers at the various schools. SIOS was founded in 1995 by another violinist, Robbin Close, and Hilary worked with her for a time. But when Robbin left Santa Fe in 2003, Hilary became the sole violin teacher in the program, and the Festival used that transition to make SIOS a part of its existing educational programming, with continuing support from the Santa Fe Public Schools, Rebekahs and the Independent Order of Odd Fellows, and individual schools and principals involved with the program. All of the violins and bows need regular maintenance to keep them in the best condition for the program’s students and we are especially grateful to The Violin Shop of Santa Fe for the beautiful work they provide to SIOS. Hilary tells the story of a very special 2nd grader, Ana, who came from Mexico with her family. “No one in the family spoke English, but she entered the Strings in Our Schools program. She not only worked hard but was also very talented. She was my star performer.” Now in 5th grade she is Hilary’s most advanced student, excels in English reading and writing and math, and serves on the student council. And that’s what music can do.